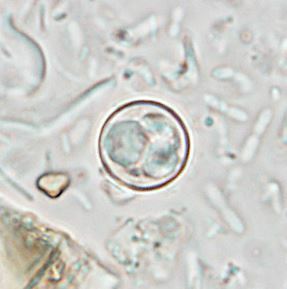 Cyclospora cayetanensis oocysts are similar to Cryptosporidium parvum oocysts but are approx. twice as large. Both are acid fast and stain pink/red/burgundy with safranin . Cyclospora can be more acid-fast variable and can have a bubbly appearance and be granular. In unstained wet mounts, Cyclospora appear glassy non-refractile spheres. 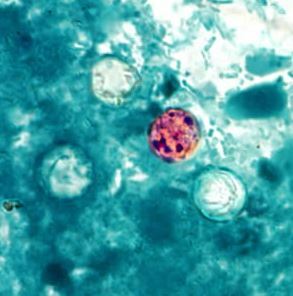 Cyclospora is a pathogen affecting upper GIT and small bowel. It may cause explosive diarrhoea. In most cases the diarrhoea is self limiting. Outbreaks have been linked to contaminated water and various types of fresh produce including lettuce, snow peas, basil, raspberries. This entry was posted in Protozoa and tagged Cyclospora. Bookmark the permalink.